Sheds aren’t made to last forever, and eventually you have to knock them down. Whether it’s getting too small for your storage needs or completely falling apart, tearing down a shed is not a difficult task—provided you follow the proper steps and precautions. While there are some variations between tearing down wooden and metal sheds, our seven-step guide will go over the best way to demolish it so you can get the job done right. A shed demolition plan helps you be successful. Knowing if you need a permit from your city, what tools to use, having a disposal plan and knowing general shed demolition costs will go a long way to making the project easier in the long run. Each city has different ordinances in place, but a permit is commonly required when a structure is being built, changed or demolished. Prior to tearing down your shed, it’s a good idea to reach out to your city government to see if a permit is needed. Demolishing a shed leaves you with a large pile of rubbish to take care of. Come up with a disposal plan before you get to work to help eliminate stress at the end of your project. From shingles and sheet metal to wooden beams and nails, a dumpster is a good catch-all for projects with a lot of debris variety. There’s no magic answer to the cost of removing a shed. For DIY shed removal, your only costs will be for tools, materials, permits and disposal. If you’re considering hiring someone, there are a few factors that can adjust the price. Cost Advice: As a base-line, consider roughly $200 as the minimum for a DIY shed demolition. As you go through the list below, note issues that may come up that will increase the base cost. The national average to hire someone to tear down a shed is closer to $1,500. Location: Where is the shed on your property? Is it easy to access or are there lots of obstructions or hazards? The more accessible the area, the cheaper the job will be. Material: What is your shed made of? Metal, wood or stone? Different materials will cost more or less to tear down, with heavier materials costing more due to disposal fees. Condition: If a shed is in great condition, it will take more effort to tear down and increase the cost. While a decaying shed can be cheaper to remove, if it poses a danger to those working on it, the removal price will be a bit higher. Attachments: Not only do you have to consider how the shed is attached to the ground, but also what is attached. Is it simply built on the ground or a concrete slab? Does it have electricity, water and gas? The more attachments, the more expensive the shed demolition and removal cost. For the most part, you won’t need any heavy-duty or special tools to knock down a shed — unless you want to use them. The bulk of the tools needed are things that come in your standard tool kit. Pro-Tip: Prior to dismantling, turn off any utilities running to the shed from your house. It is best to find a professional to remove wires or pipes attached to the shed and ensure that they are properly capped or removed to avoid any future issues. Now that you have a plan, it’s time to get to work. Keep in mind that some steps will be easier than others, but the project should take about a full day to finish. An empty shed makes tearing it down much easier. That doesn’t mean you have to throw everything out, but you do need to get it out of the way. For anything that you would like to keep, make sure it’s stored somewhere safe to avoid damage as you start your shed demolition. This is also a great time to sort through unneeded or broken items. Three piles should do — donate/recycle, hazardous disposal and throw away. Certain things in your shed that you may want to get rid of, such as propane tanks and pesticides, are considered household hazardous waste. These items are prohibited in landfills and need to be disposed of separately. Check with your city government to see when they have a hazardous waste collection event. If you want to donate or recycle shed materials, consider their condition. There are companies that accept donated wood from your shed for refurbishment and reuse. However, if the wood is too decayed or damaged during removal, it will not be accepted. You can also recycle metal sheets from your shed, but rust may make them unacceptable. Pro-Tip: Note anything that could be hazardous as you start to disassemble your shed, such as nails in studs used as hooks, broken window panes and unstable shelves. Remove what you can now and remember the rest for later. Before you get to demolition, remove any wall fixtures, shelving or storage accessories. It’s as much for safety as it is for making the walls lighter for later steps. Simply use your screwdriver to pop the doors off the hinges or take the screws out and remove the hinges entirely. You can remove the side of the hinge still on the frame now if you would like. Removing windows now helps prevent injury later in the process. Get rid of any caulking and trim around the window using a combination of your hammer, chisel and screwdriver, then pry out nails or screws holding the window in place and slide the window out. Pro-Tip: To help avoid the window panes breaking or making a mess if they do, use contact tape or a heavy masking tape on both sides. If the pane breaks, the pieces will stay in place. Whether you’re working on tearing down a wooden shed or a metal shed, the roof is the place to start. As you remove parts of the shed, the structure will become increasingly unstable. That’s why it’s best to work from top to bottom for safe demolition. Safety Note: Most shed removal projects will require you to use a ladder to work on the roof. If you are uncomfortable with heights or don’t have a spotter nearby, consider hiring a pro. Start at the peak of the roof. Remove the shingles using a hammer and pry bar or a roofing shovel. Throw removed shingles into your dumpster as you go. Pull off the underlayment and sheathing with a pry bar so that the rafters are exposed. To find the seam between sheathing boards, try removing some of the underlayment. Pry apart the rafters with a hammer and crowbar. You may need to remove nails or screws first. If the rafters are not coming apart easily, use a reciprocating saw and cut near the points where the rafters connect to the walls. Toss remaining sections of the roof into your dumpster. Weight Tip: Not sure how much it will cost to dispose of your shingles? Check out our weight calculator to get an estimate. Remove the nails or screws holding the sheet metal in place, starting at the peak of the roof. Repeat until all sections of sheet metal have been removed. If there are rafters under your metal roof, pry them apart with a hammer. You may need to remove nails or screws in order to do this. If the rafters are not coming apart easily, use a reciprocating saw and cut near the points where they connect to the walls. Toss the debris into your dumpster. Safety Tip: Never stand on the sheet you are removing. Once the final fastener has been removed, it will slide off the roof, taking you with it. With the roof removed, it’s time to work on the walls. You’ll want to start with the wall that had the door in it, as it is the least structurally sound. From there, follow the steps below on how to tear down the walls of a wooden shed or a metal shed. Safety Note: As you remove individual walls, the remaining ones will become less stable. Consider having a friend or two stabilize the wall as you work. If you are working alone, have 2x4s handy to create temporary supports by digging a small hole in the ground and set the 2x4 at a 45-degree angle to the shed wall. You can also do the same on the inside by bolting the 2x4 to either the shed floor or the remaining wall. If you want to save the siding for reuse or recycling, start by using your hammer to pry all attachments from the shed frame. Once completed, gently knock the siding from the inside until it comes off. Repeat for all four sides. Remove any connections to the floor using your adjustable wrench and pliers. If floor connections can’t be removed and you don’t plan on reusing the floor, use your reciprocating saw to cut through the frame on each side of the fastener. Otherwise, use your sledgehammer to hit the frame and force the connection out. Find and remove any connection to other walls. Push on the wall frame until it falls down. Be sure not to use too much pressure and fall with it. If you don’t feel safe, use your sledgehammer to hit the frame until it falls. Remove the knocked down wooden shed wall and dispose of it. Repeat steps for the remaining walls, keeping in mind the structure will become less stable as you continue and may need to be aided by temporary support. Remove any connections to the floor using an adjustable wrench and pliers. If floor connections can’t be removed, use a sledgehammer to lightly hit the walls outward, which will sometimes force the connection out. Find and remove any connections to other walls, keeping in mind the nails, screws or bolts could be on the outside of the shed. Use your sledgehammer to knock the wall outwards and force it over if the wall doesn’t automatically fall down. Remove the dismantled shed wall from the area and dispose of it. Repeat steps for the remaining walls, keeping in mind the walls will become less stable as you continue and may need to be aided by temporary support. If your shed has flooring, use a crowbar to pry up the planks. If your flooring is on legs and you feel comfortable, use a reciprocating saw to cut through the floor and speed up the process. Once the floorboards have been removed, see if the legs have fasteners to the ground and remove them. If your shed doesn’t have a floor, there may still be a concrete slab. If you plan on reusing the concrete slab, you’re done. If you want to remove the concrete, check out our concrete patio removal guide for tips. After you’ve finished disassembling your shed, you should have three piles to work with: garbage, reuse/recycle and special disposal. If you’ve been throwing debris away as you work, the garbage pile should be pretty small. Now’s the time to throw any remaining debris into your roll off container as you clean the job site. And if you have any items to recycle or maybe some hazardous waste to dispose of, remember to find a local disposal option. 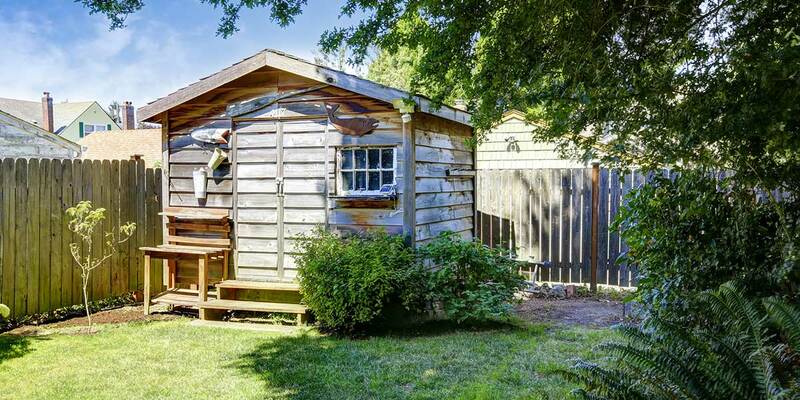 Now that you’ve successfully demolished your shed, there are plenty of options for your yard. Maybe you want to plant a garden, build a fire pit or put a new shed in its place. Whatever you choose, enjoy that the space in your yard is the result of your hard work. Still working to make your backyard the best it can be? 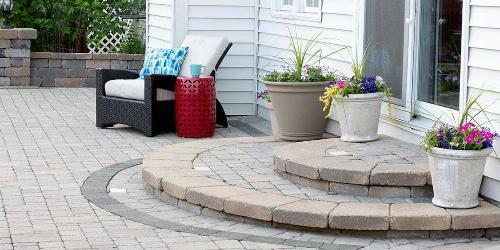 Check out our DIY Backyard Projects guide for inspiration or our Yard Cleanup Guide to learn even more ways to open space in your yard. 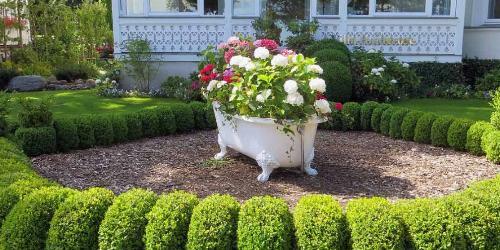 Create the chic yard that dreams are made of with these simple backyard DIY projects. From an outdoor kitchen to a cozy fire pit, these outdoor living space ideas will have you spending more time outside than in.